When 42 Below hosted their famous Cocktail World Cup in Queenstown they not only showcased their own eccentric style of marketing, but also promoted to the world that Queenstown was a leading destination for unique and creative themed events. Queenstown has the facilities and character to host a truly unique themed event and 42 Below were the perfect company to put the town to the test. Impressing a hundred mixologists from around the globe as well as the kings of experiential marketing, 42 Below! QT Event Management took the event brand guide provided by 42 Below and created a themed event, with supporting background story, that followed the whole three day event. 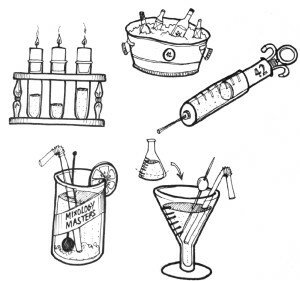 The concept that bartenders are scientists at work, with the bar being their laboratory, was taken by the QT Events team and showcased in three main themed events. Competitors at the Cocktail World Cup found themselves immersed in a flowing theme that began as soon as they arrived at the airport. The theme was unique, edgy, interactive and very weird at times! Props, projections, audio effects and actors were used to create a sensory experience for the competitors and ensure their time with 42 Below in Queenstown wouldn’t be forgotten in a hurry. Thank you so much your work on the CWC! The feedback especially around Arrowtown Hall has been amazing. I would use you again in a second. You are a great team and I cant thank you enough for all the creativity you put into the event.